Two weeks ago, I wrote a post on surviving on a $30 per week grocery budget. Many of you found the post helpful and inspiring. But a handful of people really disliked the post. In the blogging world, that’s totally to be expected. You can’t please and inspire everyone all the time and I’ve learned and grown a lot as a person and a writer from the constructive criticism I’ve received as a blogger. However, what I found interesting was that most of the people who didn’t like the post got hung up on the fact that I was suggesting you eat peanut butter and jelly sandwiches for lunch every day for a week. The grocery list and menu I shared was meant to serve as an example that you can eat on $30 per week and still set aside a little extra toward your stockpile so that, within a few weeks, you can have more wiggle room and variety in your diet. I wanted to show that it can be done — if you’re willing to get creative and you’re willing to make short-term sacrifices. While eating peanut butter and jelly sandwiches every day for a week might sound outrageous to some, it’s actually not all that bad. In fact, one of the many little things we did to stay out of debt while my husband was in law school was to eat lots and lots of peanut butter and jelly sandwiches. We didn’t eat peanut butter and jelly every single day of the year, but choosing to eat peanut butter and jelly sandwiches on a very regular basis over Subway or Sonic — or even turkey and cheese sandwiches — was a simple thing we could do to help inch us in the direction we were aiming for. How Motivated Are You to Get Where You Want to Be? Where do you want to be financially in a year from now? What about five years from now? What simple short-term sacrifices can you make to help you get there? If eating peanut butter and jelly every other day isn’t your thing, consider what short-term sacrifices might work for your family. When Jessica and her family were working really hard to get out of debt, they set their thermostat up a number of degrees in the summer in order to save money. Jessica was pregnant at the time and I’m not quite sure how she managed, but their family was highly motivated so they made a lot of sacrifices — including sweating out a hot Kansas summer — so that they could get out of debt much more quickly. If you want to get out of debt, stay out debt, save more, or give more, it’s likely going to mean making some sacrifices — especially in the short-term. You can’t change your financial situation unless you also change the way you’re doing something. But you have to be willing to change, willing to cut back, willing to give things up, willing to eat less than gourmet meals, or willing to not have the latest and greatest gadget or gizmo. How willing you are to make changes is directly dependent upon how motivated you are to get where you want to go. If you want something badly enough, you can usually find a way. It won’t always be easy, fun, or glamorous to make short-term sacrifices, but it will be every bit worth it. What simple, short-term sacrifices is your family making to get where you want to be financially? I’d love to hear! Meatless meals are saving us so much money! And I am learning about how to incorporate proteins that are healthier for us anyway. I agree! We started doing a ton of meatless meals while my husband was laid off and we ended up keeping up with it after he got back to work. We feel so much better health wise and the savings are amazing! Also, it is a lot of fun to try veggies cooked ways you’ve never had them before! While we were in college my husband and I probably lived on a lot less than $30/ per person…but back then we had no cooking skills so it was mostly gross college food like Ramen and those dollar pizzas! Right now it is a bit warm outside, 84 but nothing like how hot it will get this summer. Last year our electric bill was mind boggling from running the air so we are aiming for less usage until we get to the 90’s and 100’s. So far we haven’t turned it on but can hear our neighbors. Hurry and post the freezer cooking…lol…I don’t have much time! What’s wrong with eating peanut butter and jelly for a week? I’ve eaten PB&J almost every day for probably 25 years! Seriously, probably since kindergarten. But I am a person who really likes routines. Many school children eat it every day by choice. I know my kids do. They love it! My husband asks for it frequently too and my kids much prefer it to meat and cheese sandwiches! My preschoolers and hubby prefer pb&j for lunch over anything else, lol. I have to try to encourage new items once in awhile to give them variety for lunchtime. Question?? I think “most” people aren’t willing to sacrafice to achieve their goals. How do you deal with people constantly knocking you down? My husband and I have lived with 1 car for 5 years now, and with 2 kids I am stuck at home A LOT!! Instead of friends supporting us, they are always putting us down or saying backhanded compliments. I would really question how good of friends are constantly putting you down but I would stand up for yourself and say it’s your choice and it’s not up for discussion. There is always something in anyone’s life someone else can criticize but I find that being firm and confident in my decisions and if someone insists on being rude or giving unwanted advice saying “______ is not up for discussion” works nicely (and that goes for weight, family planning, finances, anything). some friends!! good for you, for the sacrifices you make that make it possible for you to be home with your kids! I disagree that “most people aren’t willing to sacrifice to achieve their goals.” I think “most people” are very willing to sacrifice for their family’s benefit, but are just searching for ideas and methods that work in their particular situation. Just because my sacrifice doesn’t match someone else’s definition of a sacrifice doesn’t make mine less valid. That I haven’t had any new clothes (even from Goodwill!) in several years may be the equivalent of someone else’s Every Day PBJ. There are lots of different pathways up the mountain! So true! Plus we all just get caught up in competition to have the biggest and the best. It’s not easy to do without sometimes, especially if you don’t have encouragement! That’s tough. We too have just one car. It helps that my husband can take the bus to work when he needs to, but to do that it means we live on the opposite side of town from most of our friends, so I still don’t get out to everything they do together. It could be that these people are secretly feeling guilty that they’re not doing a better job, or envious of something about your life. Maybe it would help you to think to yourself (or say, if it’s appropriate) that you’re not trying to tell them they should give up a car – they’re allowed to spend their money the way they see best, and for you, being a one-car family is best. And then 1. try your best not to care what others think about you and 2. seek out an additional friend who is more like-minded in this area. I’ve had my own struggles in this area – we attend a church that is quite affluent, and a lot of things I see my friends spend money on is over the top to me, but it’s just normal to them. So I feel left out and jealous and sometimes, looked down upon. But I’ve found some friends who are like-minded, and the others I start to understand when I get to know them better. Everyone has their struggles. Yep, we dealt with it too! We have been together for 6 years and just this year we finally have 2 cars….one unreliable, so about half the time we’re still one car 😉 Family was the worst for us….they just didn’t understand! They thought we were crazy for driving an old car, renting a small house, and buying everything used. I tried to change their perspectives, and for some it was hopeless, but for others it actually worked! My father used to tease the daylights out of me for couponing….just today he called me to ask if I seen the fantastic coupons this Sunday! Couponing has kind of become fun this since he, ironically, lost his income. So, be patient with them. Some will see the light, and unfortunately, some will not. You need to find some new friends–ones who have the same ultimate goals and understand your life choices, not judge them. Jen, I wish I could find a friend like you. I hear the same things from people. They just don’t get it (and I have no idea why). Ditto! I need to start praying for like minded friends :)) thanks for all the encouragement! I can relate to living with one car. We have been a one car family for about a year now. We are waiting to save enough to buy a “new to us” car for my husband. Today was one of those days I was stuck at home. A lot of people think we are crazy. Visiting blogs like this one and surrounding ourselves with like minded friends has helped us. I agree that most aren’t willing to sacrifice….I think it is a part of the instant gratification mindset. Would they rather you have two cars and ask them to borrow money? We’ve had one car for 11 years. Yep, eleven. And anytime someone comments on the fact that I don’t have a car, I tend to add, nor to I have the gas or insurance that goes along with that (nicely, and in a joking, but truthful manner). I’ve yet to have 1 person make a comment about us having 1 car twice. I usually find that when I comment on things I’m doing, or projects I’m working on, I get a lot of how do you have the time? I gently say that I consolidate all my errands, and I find that allows lots of time in my week. I’ve been so positive about 1 car, that I have had a friend or two say they wish they could do 1 car. Well said…now only if I can get my hubby on this train of thought!!! My husband is the same way, but his thing is having nice cars. It kills me to write the checks each month for our car payments and I am way too embarrassed to even say what the total is. Don’t get me wrong, having a nice car is nice but I would much rather have a not so nice car and not have a huge payment. I have pretty much come to terms with the fact that my husband just will never be content with a normal car but I still hold onto the hope that someday in the future when we finally get a car paid off (if he stops buying new ones- negative equity is a terrible thing) he will see how much extra money we’ll have. HA…I’m married to a “car guy” too! Thankfully for the past 12-13 years he got cars through his work as part of his compensation package…a brand new car every 3K miles that he got to pick out himself. Half the time he even ordered them from the manufacturer exactly the way he wanted them. But last year he changed jobs and, um, there’s no way we’re subsidizing his car habit! Our “compromise” was that the last car he ordered (at this point he pretty much knew he was going to be leaving) was reasonably equipped with the stuff he cared about but not the crazy expensive features we didn’t really care about. When he left he was able t negotiate buying it out and since it was a dealer demo and there were some other extenuating circumstances we were able to get about 40% off sticker. My 2008 minivan is paid off completely in six months so this was really something we could afford, though I’ve made it abundantly clear that (a) he had better really like that car because he’s going to be in it for a loooong time and (b) he’s not crazy about the minivan (what car guy is??) but since it’ll be paid off with less than 40K miles it’s going to be in our driveway until the engine seizes! Well said! We are a family of 5 trying to get out of debt and we eat A LOT of peanut butter and jelly (= Well there’s a will there’s a way! We simply do without things most people think are necessary. We’ve taken 1 “major’ vacation in 10 years of marriage, and that was actually our honeymoon that we took when we’d been married for 3 years! We do without new clothes for the most part. Except for those $2 or $3 tees I get at Target once in a while on clearance with a coupon! I don’t get my hair or nails done or get massaged by a therapist. I don’t have a designer-anything or an i-anything. I have a “dumb” phone. It makes calls. And that’s it. But who cares? It makes calls! We own our home outright- paid off that mortgage in 6.5 years. We have 2 paid for cars. We paid cash for our replacement HVAC system 1 1/2 years ago. We even have luxuries such as 2 pets we adopted from a shelter, swimming lessons for our children and we save for retirement and their future education. This is on a very modest salary. I quit my job last year to be a SAHM, and the only reason we could do it is because we were debt free and already know how to live very much below our means. Our future and that of our children is more important to me than eating out or eating gourmet food for lunch or having the handbag du jour. I love that you mentioned your adopted pets as a luxury – adopting a pup is one thing I’m looking forward to once my husband and I are settled and know we can afford it. Good for you! You just described my dream someday (I’m a working single mom at the moment but someday I’ll be home again, hopefully before all my kids are in school!). Wow. You are SO inspiring. Thanks for sharing!! I love this Crystal (but also happen to love pb&j sandwiches!) I have so many friends who want to save money, but ultimately aren’t willing to make a sacrifice to take the time to clip coupons or do extra work to make things from scratch (much less give up meals out!) Saving money undoubtedly requires some kind of sacrifice, and not everyone’s up for that. We live with one car, we stay home often. I have pretty firm “buy prices” for about every food we will buy and definitely plan my menus around our stock pile and grocery shop based on very good sales. It isn’t always excited or even high variety but it is nutritious and we are all at a healthy weight. I hang clothes on the clothesline, I re-wash freezer bags until they’re unusable. We do as much home maintenance on our own as we can. We rarely feel deprived but our focus is on paying our mortgage off very quickly and that is enough motivation to say no to little things along the way. PBJ can be really darned good if you make homemade bread, homemade jelly, and homemade peanut butter. All cheaper than store bought and I’m drooling as we speak. Heck, I’d live off that! We used to be vegetarians but converted back six months ago. We eat one meat a week and stretch it. A whole chicken can be used for chicken breasts/tenderloins one night, wings for our daughter, and the dark meat through the grinder for chicken burgers another. The rest of the week is still all vegetarian. We alternate cuts of meat and do various things with them. J. That is what I had last week! Sometimes it is pasta and sauce. DH & I are working to be completely out of debt inside of 18 months but I think with the extra scrimping, we can do it sooner! I like the tone of this post. You can learn and grow from comments by readers, but by turning it around this time (in a non-judgmental, non critical way) you’ve challenged readers even further. Thanks! My youth pastor gave up an engineering job to go to seminary and he took lots of hours and went to school with two peanut butter sandwiches each day…one for lunch and one for dinner…for like two years. it’s what he had to do, and he likes to tell that story. My “sacrifice” lately has been making items from scratch instead of buying convenient time saving boxed items. we’ve liked most of them better, and I like that I know what goes into them…and honestly they don’t take that much time! We made a sacrifice and found it to be a better way of life! That’s been one of my sacrifices lately too. I have the time to bake/cook but not always the inclination so I would often buy prepackaged stuff. No more! I remember once I get in the kitchen how much fun it is for me to make something. I have also been making more things from “scratch”. My kids love mini muffins so I have been buying the packages of muffin mixes and then just making them that way. I had been a SAHM for 7 1/2 years and just today decided to go back to work. It felt wierd being away from my 2 yr old but the daycare person is family so it wasn’t so bad. My other two go to school so they don’t notice anything. I have recently been trying to make more at home so I can control what is in our food. Ooooh, yes! Peanut butter and banana yum! I made my own cashew butter for the first time, using cashews “bits & pieces” on sale for $3.99/lb at my local health food store. Cashew Butter is AMAZING on a banana sandwich. Great idea! We like peanut and cucumber or peanut butter and tomato during the summer too. I agree! Peanut butter and banana is one of my favorite sandwiches. And one banana can make 2-3 sandwiches. We will probaby be eating a lot of peanut butter and jelly this summer so we can go to the beach for a week. No big deal. It’s a trade-off! I might have to try this. I used to LOVE PB&J and ate it quite a bit each week. Then when I was pregnant, it was one of those foods that I ate and it started making me gag!! It’s never been the same for me since. I like cheese sandwiches, too. I loved the original post and this post as well, very encouraging! Many people just want an easy fix or aren’t willing to sacrifice now for some benefits later. I truly feel like that is where most of the world is these days, if it wasn’t, people wouldn’t be buying their wants on credit at the speed of light and then having to declare bankruptcy. Through undergrad, medical school, and now residency we have scrimped and saved to have no consumer debt while many around us were buying cars, huge homes, and living off of government programs for healthcare, food, and housing. It’s been quite a journey, but we’ve relied on God to provide, done hard things, and gone without, but we are stronger as a family, blessed by God, and so thankful for never having gone hungry, without clothes, or other needs. Sacrificing builds character and self control, both qualities that many of could use more of. Thank you for your witness Crystal! PB&J is all about the jam. Great jam = amazing sandwich! I’m actually eating grilled cheese sandwiches (Hubs and kids are eating PBJ!) to put some money aside, lol! I’m not doing it *every* day, but enough that it will make a difference. It’s good to hear others are doing the same. My Hubby is self employed ( lawn service ) and I’m a stay at home mom of 2 ( soon to be 3 ) boys. Through our thriftiness and God’s blessings ( we’re a tithing family ) the only debt we have is our current house payment. We’re only in our 20’s and own another house outright ( hoping to sell soon or rent ) and have made an offer on another house we hope to purchase with cash. No, we don’t have the latest gadgets, cars, etc., but we have what we need and are trying to save for our future growing family!! My husband is in school and we have moved in with my parents in order to make this happen. We are sacrifing the life we knew (the comfort of having your own home) for a more stable financial future in the long run. It has been very hard w/ a year-to-date income of around $100, ( yes, one hundred), but God has been good and provided for us. I will be the happiest person at his graduation! Way to go Laura! After three year of law school with kids, I definitely know the feeling… and you’re right, you’ll appreciate being out of school all the more because of all the sacrifices you have made now. Thank you Anna for the encouragement. We also have two children whom I am homeschooling at this time. Blessings to you. I’d gladly eat PB & J- my sacrifice was hours- 2 to 3 per day! For the last 2 years my husband have been commuting to the city together for work. This means getting up at 5:00 and not getting home until 5:30-6:30 every night. It meant long hours in traffic and lots of time waiting for him to finish up at the office (my hours are 8 to 3:30, while his are 6:30-5:00). Even though it was stressful and forced us to plan ahead just to keep our sanity and get things accomplished during the week it saved us so much money. Between parking, gas, maintenance vehicles, etc. we save about $400 a month! When I remember this it makes those long days that much easier. It also allowed us to spend a ton of time together commuting! He has been blessed with a new job only 10 minutes away from home so everything changes. But I feel blessed that we were able to save SO much money commuting together over the past year- it was well worth the sacrifice! Its a pbj week for us. After a long spring, we have gotten off budget and are making a consertive effort to recomit to our cash budget. Not being used to the buget anymore, we were down to $35 to buy groceries. We decided to give it a go. We looked through our food in the house and made a list with mainly fruits and veggies. im making snacks and meals from scrath. We spent $25 at the store and our hoping it will last us to Friday. Short sacrafice to pay to try to get on a budget that will reach our goal for debt elimination and adoption! We’ve been making homemade cleaning products and laundry detergent. While I sometimes miss the ease of just picking up these products at the store, it has saved us a lot of money over time (not A TON), but I know that every little bit counts. Great post! I totally agree…it’s all about priorities isn’t it! If you’re really willing to do whatever it takes, you will find one wa y in a thousand to make it work. If you’re just looking to complain, there will always be an opportunity to look on the negative side. AWESOME quote. I’m going to try to remember it next time I feel like the sacrifices are just too much. We’re working toward a goal and little sacrifices along the way will be so worth it! I think these articles are great. Some people can do 30 a week where they live in the region of the country. I don’t have awesome prices like that. I wish!!! And I have a picky eater on my hands so it doesn’t work. I so wish he would eat peanut butter and jelly for lunch. I do! I agree these sacrafices can be done but sometimes there are limitations for certain people. I was just so happy to see my husband enjoying a pb&j sandwich earlier today because I got the two items for a very good price. And I am so thankful that we have food to eat today. Our biggest sacrifice? My husband lives with his parents (who live in another county) during the week to save money on his commute to work. It’s not an ideal situation for us, but it’s just us (no children) and the sacrifice is paying off: we have more in savings than we’ve ever had and we have been able to put more towards our debts. Okay, So we never quite did the PB and J thing (namely because I don’t like them, ramen noodles are more my flair) But similarly, We’ve gone without a furnace (but we had a pellet stove) or air conditioning for more than three years(( we live in the Southwest) . It was our goal to pay off the house completely before even considering that added cost in getting and running it. Now that we have our house paid off and are completely debt free ..I still find it hard to commit to getting air conditioning because well, we’ve done alright without it. The wait has actually made us look into alternatives. Our friends and family thought we were crazy but they aren’t saying that now..well just not to our faces! It the seemingly big and small sacrifices totally add up and I am so grateful we stuck to our guns and we are free..It feels so great ..incredible.. no stress seriously, and all those sacrifices forced us to look at the things that really matter to us it brought us clarity in our lives in which we continue to practice the principles we learned through that experience. We buy Folgers coffee on sale/with coupons and make coffee at home. I buy creamer/sweetner at Aldi. I can’t tell you the last time I paid money for coffee that I didn’t make myself at home! That saves us TONS of money even if you are just looking at buying gas station coffee! Also we limit our eating out/take out to once a week (except this past week when I wasn’t feeling well we splurged and did take out more than I like to). Sounds like we all just made many “quality” lIke-minded friends right here. French toast is our cheap meal. Healthy whole grain bread keeps great in the freezer and eggs are the luxury extendable protein. While I agree fully with this post, know that it works both ways, too. Sometimes people who aren’t as frugal, get looked down upon by those who are. Just like someone who wants to eat PBJ every day (or drive an old car, or shop rummage sales) shouldn’t be ridiculed or criticized, someone who drives a newer car and (gasp!) has a car payment, shouldn’t be ridiculed or criticized by those who are more thrifty. While trying to surround myself with less materialistic peers in the hopes that this would help me feel less pressure to keep up, I came across some of this. It’s not an all or nothing game. If I want to make home-made laundry soap, and at the same time not want to get in to coupons, thats ok. I’m not dumb, lazy, or a bad homemaker. What each of us chooses to do (or not do) is our own business. I agree. We are a one-car family w/3 kids, and that car is 20 years old, but I think we would go crazy on a PBJ-every day diet. I think it just depends on what someone can tolerate in terms of sacrifices. I also think it depends on a particular situation. It’s one thing to make a sacrifice when it’s just one or two people, but when you have kids, you have to take their situation and preferences into account as well. My boys eat a lot, and they aren’t overweight – just hungry, growing, little boys. We eat fairly simply, but I do spend more because we give them lots of fresh fruits and veggies and high-protein meals. Thanks for your comments, gals! I think it’s important to figure out what works for your family when it comes to short-term sacrifices — and be doing them with an end goal in mind. I’m all about strategic splurging — and feel like that’s one reason you make short-term sacrifices. Short-term sacrifices give you the ability to enjoy long-term benefits of being able to splurge on what is important to your family without having to worry about how you are going to be able to afford it. Frugality and financial stewardship doesn’t have to equate a miserable existence. In fact, I think it can be the exact opposite: it allows you to be in charge of your money and make it work for your family in a way that is in line with your family’s goals and priorities. Don’t feel bad about the IPhone! We splurged this last fall – got the 3gs right when the 4 was coming out. We got our IPhones for FREE, and I am so glad we got them – we travel at least once a year (my mother in law lives in California, so we have to go visit her occasionally – traveling is financially difficult for her right now, and anyway…I like her a lot! Actually, love, but whatever. ), so being connected is necessary. Now that I work at home, it is extra helpful – my desk and workphone are in our basement. But I have the ability to route my calls through my Iphone thanks to forwarding. I can sit out on my deck and work, work in the front yard while watching my son…heck, I can even work when I’m making my Aldi trip (which, I’ve closed a few deals that way as well!). As Crystal says, it’s about strategic spending. We choose to spend more on certain things – a yearly pass for the Wisconsin Historical gives us something to do, very inexpensively, throughout the year, and all over the state. But we’re happy with PB and J, or PB and Honey (I grew up eating that!) for lunch. My son especially – he’s so skinny, and plays hard, so the extra protein is really helpful. Not to mention, I really just dislike deli meat…it’s so full of nitrates and nitrites. Yucks. To each, their own. I choose to spend more on certain things because I have the wiggle room in my budget because we are tight elsewhere – I like expensive perfume. While an $80 price tag may make someone cringe, it lasts a whole year because I use less due to the perfume being more potent than something you can find at Walmart. That, and I’m a bit of a fragrance snob. “Frugality and financial stewardship doesn’t have to equate a miserable existence” I like that! Sometimes (following a few frugal blogs) I feel like if I have anything at all that I like, I’m not being frugal enough! But, it’s not necessarily true! Don’t feel bad about the iPhone. It’s your choice and if you want one and can afford it, don’t feel bad. My DH & I both have smartphones (he an Android and I an iPhone.) Every time I feel bad I remember how useful it has been to have it over the years. Maybe I don’t “need” it, but it’s my choice. As Ramit Sethi says, cut back drastically on things you don’t care about and spend on what you actually love! I didn’t get that vibe at all…we have an iPhone and I didn’t feel looked down upon. I love Crystal’s website (my name is Krystal, so I go by K* on here, lol), but I am definitely quite different than many of the commenters. I’m in law school at the moment, so very often, I end up choosing things that will save me time or are more practical in an apartment rather than the most frugal option in every case. Some of the commenters seem very dedicated to frugality above all else, and the dedication might seem judgmental of those of us who have cable and eat takeout, for example. Crystal is so not like that, and it’s refreshing! I love her posts because she’s so positive about her family’s frugal lifestyle and it interests me. I use the suggestions that I can (FREEZER COOKING! ), and ignore the ones that I can’t. I got an IPhone this weekend – I went in to down grade to a basic phone since I am home every day but it was cheaper to get the IPhone and keep my current plan. Also, it helps my brother in law with commission. 😀 I saved over $100 and will save more money in the long run. I also got a new purse (late Valentine’s gift) plus a few other items for birthday presents for family members. We splurged a bit but it is helpful to us so we stay on track with cutting down our debts. My husband can eat peanut butter and jelly every day. By the third day in a row, I usually feel like throwing up when I see PB&J. But I see your point, and it WOULD save money. Crystal, I loved that post! People read your blog for the ideas you give. Anyone who could have been offended by that post is just ridiculous. I am so glad I found your blog. No one will use or agree with every suggestion from any blog post. When you have no extra money, any ideas you get are good, if only just for a short time. Keep doing what you do. Believe me, it is much appreciated! I agree. I love getting frugal ideas. I don’t use all of them, but I don’t ridicule them either. Even the ones that I don’t use, I like having them in the back of my mind in case we ever need to cut our budget even more. I LOVE pb&j and eat it all the time! Since your post last week, I am challenging/stretching our grocery budget by making very simple meals for the next month or two to see how it works. Hot dogs, spaghetti, chicken, soup, PB&J for lunches, and I started going to the $ store for groceries and it really saved a lot. We are feeding a family of six – so it is challenging! Thank you for inspiring me!! I think $30 a week for one person is totally doable. My family of 4 spends about $250 a month for everything – dog food, cat food, turtle food, pull ups, diapers, HAB – everything. I use coupons as much as possible, shop drug stores, shop on Saturday mornings to get the Manager’s Specials, and I use rewards programs to get gift cards. I DIY repairs, bake, and make my own laundry detergent. The sacrifice I make is the time it takes to strategically shop. There are some sacrifices my family is unwilling to make. I wouldn’t want my husband to work all the time, my husband wouldn’t go meatless, and I won’t hang laundry out (kids’ allergies). I think the trick is to sacrifice in ways that don’t leave you feeling bad, but make you feel good about how you’re helping yourself and your family. I’m getting so hungry for PB&J right now– it’s not even funny!! Thanks for posting this. We are experimenting with ways to save on our electric bill right now. We have even explained to our kids that we try to keep the bills and other expenses down so we can save for other things. I think it’s good for them to see that some sacrifices they make have positive effects on the whole family! I think I’m going to have PB & J for breakfast tomorrow, LOL! I LOVE PB&J! We also eat lots of baked potatoes, beans and rice, and eggs… very little meat. We are currently in transition and it works best for us, and saves us money! Crystal, I’m so glad that you understand that you can’t please everyone. I’m also glad that you didn’t back down from the pb&j idea. Because that is all it is – one idea as a way to lower costs. My husband and I are very frugal and after I decided to be an at-home mommy, we became even more frugal. He takes his lunch to work almost every morning. For a two year span he took pb&j. He ate it sitting at his desk everyday while watching others go out or eat things much more glamorous. I admire him already, but even more for his dedication to us and our financial freedom. We have been married 24 years and I have been a stay at home mom to our three children for 20 years. The secret we have found to financial freedom is tithe faithfully ,no matter what. Participate in the company 401 k plan to provide for retirement and then live on the rest. Spend it on whatever makes you happy, just don’t ever use a credit card when the money runs out! We are sacrificing to pay for college for our children because we want to do this for them as they are hard working , delightful kids and it is our gift to them. Having said that, the entire family is sacrificing- no new clothes, no vacations and very little eating out. I have been clipping coupons for the first time in my life and it is fun! I just make a game of it and make the kids look at my receipt after I return from the store and they are obligated to brag on how well I did! I remember when I paid off my old mini van. We ended up keeping it for several more years. There was rust on it and it occasionally needed repairs, it still worked. One of my co-workers joked about how I need to take it out back and put it out of its misery. Other people made comments about our small 2 bedroom house with three kids. It was very small and I was selling Avon in addition to a full-time job to get ahead. I remember having to wait until the kids were in bed to get my orders ready and then hurry up and pack it up because I didn’t have any space. It was so tough, but by doing this, I am now in a beautiful house in the country where my five kids (now) can play outside and ride bikes in our neighborhood without worrying. It was definitely worth the struggle. I admire your dedication! My husband’s car has been paid off for years and mine is almost paid off. I’ve only had 3 cars in my life because I’ve driven them until they no longer ran and the cost of repairs was more than the cars were worth. A lot of people wonder why we still drive compacts with two car seats and why we swap cars rather than buy an extra set of car seats. I just scoot my seat up while the kids are in the car so they have leg room. Most days my kids aren’t in the car for more than 15 minutes at a time so really, it’s no big deal. It takes me a few extra minutes to exchange cars, but I figure that is really a small sacrifice. I do plan on buying a larger car when my husband’s car finally needs replacing, but I’m in no hurry. I just think it is about priorities. In the area that I live in, I see plenty of pricey vehicles parked in front of mobile homes. I have nothing against mobile homes and several of my family members live in them, but I prefer to have a smaller car and a bigger home. I agree, I used to spend 500 a month on groceries for our family. As soon as I discovered all these blogs, I got it down to 60 a week. Over half the budget. I kept thinking I would eventually have to go buy a lot of stuff to replenish, it’s been two years and I never have. Like Jeffrey Staind’s family, my family (not husband and kid) thinks I’m crazy. While they think we are poor, I’m really beefing up the savings. They were all shocked when we announced our big family vacation to Disney!!!! I loved your previous post. It really gave me some good ideas on how to cut our grocery budget even more. People made fun of our crazy savings goals and thrifty lifestyle, but now we have so much more freedom from being debt free! I would never trade the freedom for their approval. We eat a lot of peanut butter around here, but I often leave off the jelly. My family gets pretty excited when they see jelly on the sandwich too! 🙂 I think Americans are spoiled. We were completely debt free in our mid 20s, but continue to live way below our means. It is a choice we make to teach our children to be good stewards. It has also allowed me to be a SAHM, to build a house (debt free), own 2 vehicles, and adopt (which is the best reason of all)! Back when we first got married, my husband and I ate PB&J for lunch and sometimes dinner too! We lived in a tiny 2-bedroom apartment and wanted a house SO BADLY…..with cost-saving measures like eating PB&J and driving our paid-for pickup trucks (we both had one prior to marrying), we were able to save $10,000 in 2 years to put down on a house. Now that was about 15 years go, but the principal is the same…..if you want something badly enough, you’ll do whatever it takes to get it. I really enjoyed you previous post. You were not telling people that they SHOULD eat just pb&j; you were only giving people ideas as to what they could do. It was meant to inspire people and that is how I took it. We just found out problems with our dogs heart murmur will cost us almost $1,000 this week, so PB&J every day sounds fabulous! Yay for PB&J! I eat a PB&J sandwhich almost every morning for breakfast. Me too! I eat it because I LOVE it, not just to save money!! PB&J sacrifices have allowed me to be a SAHM while my wonderful husband is deployed overseas. I’d say the best days are when I spend no money at all. I load the kiddo into the stroller, pack up some lunch or snacks, and walk the mile to the park to spend the majority of our day. I keep my tail in shape hoofing it to the park and then chasing our daughter without needing a gym or expensive at-home equipment. Our little munchkin is perfectly content to spend her days on the playground and eating basics. She doesn’t care if we spend lots of money on her. And my husband and I are more content parenting without having to worry as much about our cash flow. I identify strongly with your post. In the early years with my daughter, our best memories are of the times when we had very, very little (I had to wash her clothes every day otherwise she didn’t have clean clothes to wear). We ate simply and a walk to the park to feed to ducks stale bread (we’d ask our neighbors for theirs because we never had any) was loads of fun. In those days, slices of bread with cheaper spreads were ALL we ate for lunch! On the note of your reply. I love what you said. We are in a very tight spot financially and my dh works a lot of hours. We share one (very old) car and he takes it most days to save gas and because I’d have to wake up at 5 and be out the door around 6:30 to get him to work on time which is not the easiest feat with toddler in tow. We have a park nearby that is wonderful, designed for toddlers with a wonderful shaded picnic area that we used to love to go to and haven’t been in some time because it is quite a walk….not sure if it is a mile or more than that, but it is near enough to drive to in about 3 or 4 minutes but walking just seemed out of the question..and it is the nearest park…. but, I spend a lot of days feeling cooped up, and I have weight I want to lose. Plus, my son spent most of the first 3 years of his life (he is about 3 1/2 now) in physical and occupational therapy for a stroke he had at birth causing brain damage. He has no mental symptoms…just physical….one sided hemiparesis (he is very weak on one side) and hypotonia (low muscle tone making it hard for him to build muscle strength) and that has caused him to struggle with his right hand/leg and he was very late crawling/walking etc and is weaker than his peers. Anyway, he was cleared from therapy and if you look at him you’d never know anything was wrong, but it seems to me like he still struggles….now the therapy he was in was home therapy and lots of times we’d go to the park, so I know how to work with him, and right now after having been cleared from therapy, and him aging out of the ECI (home therapy from birth to 3) he’d have to go to inpatient therapy which is so so expensive…more than we could afford (obviously if it was a clear need and the doctors agreed we would MAKE a way to pay for it) but since I know the exercises the therapists did and he is mostly caught up, taking him to the playground and spending time there everyday, would be a perfect way to get in free therapy (basically he just needs to do what other toddlers do, but more, in order to build his muscle strength, and we do things like coloring and puzzles to work on fine motor strength)….he’d be growing physically and benefiting, and I would be as well because I’d lose this extra weight I’m carrying, plus packing up some snacks and spending a few hours in the sunshine would be a very fun way to spend the mornings. Thanks so much for writing this! I am laughing because I LOVE pb&j, but one of the things our household does to cut down on expenses is to only buy jelly as a special treat. In the meantime, it’s peanut butter and molasses (in a gallon jug at a very good price). Oh, I’ve never thought to try molasses! What temps do you set for each times of the year? Winter? Summer? In the winter, we set our thermostat at 62 during the day and 59 at night. I turn it up to 64 or 65 when we have company. My husband and I have been married 6 1/2 years, and we’re accustomed to “sweating it out” all summer, and adding layers so that we can turn the heat way down in the winter. We’ve been living frugally for so long now that I’d forgotten that other people still paid for those high costs. Unfortunately, our grocery budget is one place I can’t cut from. It costs us more to eat because we don’t eat any grain products or processed foods in general. If it comes in a box, I don’t buy it so the cheap meals that you can stretch out like pasta, rice, beans, bread aren’t doable for us. Only real meats, whole fat dairy, eggs, non starchy vegetables, nuts and berries. But I do shop for the best prices for those items. My husband and I have started attending the gym regularly completing intense workouts each day. My body went into shock mode when it wasn’t getting what it needed after the increased workout schedule. As I have always cooked from scratch and stayed at a $60 weekly budget I thought I was doing okay with nutrition and such. BUT after lots of reading and asking around it seems that there was not enough good protein in our diets and too many carbs from grains. I purchase mostly “superfoods” these days: greek yogurt, eggs, nuts (pistachios, almonds), raw honey, lentils & beans, everything whole wheat or make it myself, coconut oil, trail mix, lots of veggies and fruits, fish, chicken, pork loin, a little beef etc. Yes I do eat PB&Honey on homemade whole wheat bread-one of my favorite snacks! My food budget has since gone through lots of ups and ups, but I feel that it’s worth every penny. If it’s going to keep me well and alive for even a year longer I’ll be happy. I have noticed a HUGE difference in the way I feel, I have lost the last 5 pounds I’ve been wanting to lose, and am the smallest (inches) then I’ve ever been (thanks to the strength training):-). My four boys and hubby have also noticed a difference-especially my child with ADHD. Lesson learned for me personally-I’m more willing to cut a lot of other things first before I sacrifice the food bill. Yes, the 100lbs I’ve lost over the last 15 months are worth every extra penny I spend on my grocery budget. I also reversed my type 2 diabetes and that is priceless. Congratulations, Tami! That’s fabulous and worth every penny you’re spending on whole foods! Yea! This is exactly what i am hoping for. Wow! Way to go Tami! You’ve just added years to your life! Crystal, this post made me smile. I remember thinking “seriously? Out of all that we’re hung up on PB&J? Could be worse. My Grandpa eats a PB&J sandwich for lunch every single day, and he COULD afford more no problem. Why hate on PB&J? It’s true. Since honey is made by bees using pollen, and local honey uses local pollens, it helps to keep allergies down. My mom eats honey from Ontario, and has no allergies when she’s there, but as soon as she goes back to Utah, allergies abound! huh, I am going to try this honey thing with one of my kids. We just love peanut butter and honey sandwiches! We LOVE peanut butter and honey sandwiches. We eat them over PB&J any day. I love me some peanut butter on toast with slices of banana drizzled with honey. It’s messy but sooooo yummy! It’s one of only three ways I will ever eat a banana (the other two are in a yogurt smoothie with frozen strawberries or in banana bread). In my house this treat is a special dessert! Our pb&j sacrifice has been spaghetti 3+ times a week 🙂 I enjoyed reading the original post…it showed that it is possible to get ahead financially with a few sacrifices. Many of the “haters” seemed to have excuses why the couldn’t/weren’t able to make a sacrifice. Excuses are not allowed in my husband and my personal journey to debt freedom. My husband and I eat PB&J almost every day for lunch when we are at school. It’s what we have to do. Turkey and cheese are expensive! PB&Js are still nutritious and leave room in the budget for dinners with meat–some days. On days when we are home, we usually have leftovers, which I plan for. And honestly, if my mother did not give us homemade jam, we would just be eating the PB on bread. I love posts like this, Crystal, predominatly for the reader comments because I get so many ideas!!! I love Dave Ramsey’s comment: “Live like no one else so that later you can LIVE LIKE NO ONE ELSE!! !” If you want it bad enough you’ll do whatever it takes! LIVE LIKE NO ONE ELSE, SO THAT YOU CAN LIVE LIKE NO ONE ELSE!! it boggles my mind that people are so unwilling to “sacrifice” even the smallest of things in order to achieve their goals. i don’t know if that’s more disturbing or the fact that we’re even referring to eating pb&j as a “sacrifice.” it may sound trite to remind those people that there are children starving in africa but….THERE ARE CHILDREN STARVING IN AFRICA! good grief. we are a spoiled, ignorant people!! We have starving children right here in America, too. There is a very real childhood hunger problem right in our own backyards. Most people would be shocked by the number of kids that go to bed hungry in this country. I missed the post that all this hullabaloo is about. However, I will say this I think people tend to view things through their own experiences. It’s great to tell people that they can sacrifice and live on a 30 grocery budget. It’s less easy to live the day to day of living on a bare bones budget and getting stuck almost each and every payday with some sort of disaster. My daughter has impacted wisdom teeth. The cost of extracting them WITH dental insurance is over $1400 dollars. I can’t imagine what a person making minimum wage without insurance would be stuck going without in order to pay for dental care. It would take over a year budgeting out over $100 a month with that insurance. The costs go up to over $200 without it($2500 for sedation and surgery without insurance). Add in stuff like tires for a car when you have a slow leak for your transport or stuff like an unexpected job loss and you have a recipe for disaster. Check your medical insurance. Because my daughter’s teeth were impacted, the extraction was almost completely covered. I KNOW… I read a book not long ago (Revolution in World Missions by K.P. Yohannon, from Gospel for Asia) and it described how the people of India and the missionaries living there regularly miss meals, sometimes even for a day or two at a time. My husband and I were living in China at the time, and saw how little our students and fellow teachers often ate for meals. Well, let’s just say that we realized what a luxury it is to be able to eat PB&J every day for lunch. I have believed this for a long, long time. It’s how couch surfers still manage to have $5 per day for cigarettes. I recently saw a woman pay 7 for a pack! Holy cow, that’s alot of money! Crystal, I found your post to be very inspiring and I don’t think its outrageous at all. Of course, that is because I married someone who grew up in the middle class, but knew the value of living below his means. My husband has been eating peanut butter and jelly sandwiches (along with a few other snacks to go in his sack lunch) for well over 10 years now. Never once has he acted like a deprived martyr for having such a diet. Instead, it seems to give him greater satisfaction/contentment when he gets to enjoy a really special dinner meal. His actions have taught me so much about the lesson you are trying to espouse–If you want something badly enough, you will find a way or if you have a long term goal in mind, you will be willing to make small sacrifices daily. Thank you for your posts! I love your point – If you want it bad enough, there are sacrifices you CAN make to get there. This doesn’t mean you need to sacrifice your health or sanity, but each of us can find sacrifices, little or big, that will help us reach our financial goals in the long run. If simplifying your menu and lowering your grocery budget does not work for your situation, there are plenty of other things you can do to cut back. Thanks for your posts Crystal! They always motivate me to be better. I LOVE your posts and was pretty frustrated when I read that people were getting mad about the peanut butter and jelly!!! Sometimes people complain about the silliest things! Before our switch to a Paleo lifestyle (due to medical reasons) I ate a peanut butter and jelly sandwich EVERYDAY for lunch. I actually looked forward to it, even after months of the exact same thing everyday, haha. My coworkers thought it was awesome that I still ate them. I just wanted you to know that I LOVE reading every post! I’m also really trying to wait and see how God provides for a need before just going out and buying something. For example, I really wanted to start working on a quilt, but was unhappy with my fabric stash choices. Then my mom sent me a 42 lb box of fabrics she was getting rid of as she prepared to move. It was a beautiful range of colors and patterns – perfect for quilting! We actually sacrifice a lot and keep to pretty simple meals. Our simple living has helped us pay off over 30,000 in debt. When we hit one of our goals I plan a splurge meal which I like to call a “vacation in a box.” When we are getting closer to reaching a goal, I start putting a little money away and buying sale items to do a really fun themed meal. This past weekend we enjoyed “Memphis” with ribs, coleslaw, sweet tea, etc. My husband and I aren’t big phone people so we use Gmail’s free service to make outgoing calls and have pre-paid cell phones for emergencies only. A lot of people actually get angry with us, and I mean ANGRY for not having Smartphones. I actually had someone call me an idiot the other day for traveling without an iPhone! I think sometimes people look for excuses when they don’t really want something (like being out of debt and living within their means instead of buying anything they want on a credit card) as much as they think they SHOULD want something. We do not have iPhones or fancy Droid phones either. I bought a map on a trip and taught my 13 year old how to read it! I took a trip and had no cell service for a week and I survived–limited internet too! I am going to look into gmails free service. Thank you. I make 15 PB & Js per week for lunches. My husband routinely takes leftovers for lunch. Now he is away all week for work and takes food I have prepared from home for the week. I know this is saving us a ton. I just have to pop in and say hi to a woman with almost the same name as me! (I’m Sara Beall, pronounced Bell not Beel.) Nice to meet ya! Ha, it’s a small world after all! My husband, two kids, and I eat PBJ’s at least every other day. Not only is it an inexpensive meal, but it saves me time. When my husband and I have first got married, I fed us both for $120 a month. Granted, that’s a lot of PB&J and $1.29 Totinoes pizzas, but it worked. I’m pregnant now, so our food budget has gone up considerably, but we really wanted to focus on paying off debt. I agree with you Crystal. I just feel like such a failure right now because we have $12000 in credit card debt (wow, just admitted that for the first time) and I don’t know how to even make a dent in it. I am lost and overwhelmed and embarrassed. I can cut down on meat and eat peanut butter and jelly for lunch everyday, I actually like it. At least it is a small first step. Thank you for always being so upbeat and encouraging. You don’t have to give up everything, but you can’t always have everything either. Don’t feel like a failure – many of us have been there! Figure out a plan and keep at it. There are some great ideas here to help you save money. Read Total Money Makeover, if you haven’t already. I find reading other people’s stories helps me stay motivated and keep working at the goal. I eat PB&J almost daily. I don’t eat meat, so this is easy and I love peanut butter! I don’t make my family eat it, but it’s what I have most days. It works and that’s all that matters! I love PB&J…too bad we are out of bread. Ha! Seriously though, I have found it challenging to budget groceries with a child that has food allergies. As someone mentioned prior, we have to cook things from scratch due to dietary needs. The part that is really hard is so much of the food out there…even the fresh food…is not healthy for you. I try to buy organic when I can and whole foods, but I am not convinced that a family of 4 (not counting littles) could really eat healthy off only $30-50 a week. And, I am a great couponer. I try to save on non-food items to compensate, but if I were looking at true whole foods for a family of 4 (in my area) I’m not sure I could keep it at $30-50 a week. An example is that our children love milk. If you want to get a gallon of organic milk, you would need to pay $6-7 if not more. My family could easily drink 3 gallons a week of milk you let them. I find this so funny, because my husband ASKS me to send him pb&j sandwiches for lunch. Actually, eating PB & J isn’t that cheap these days? Has anyone seen the price of PB and jelly? Wow! Glad I stocked up a few months ago. As someone who grew up dirt poor, we often couldn’t afford PB & jelly or bread. So we ate “buttered” margarine saltine crackers for our lunch instead. If we were lucky in the summer, sometimes we would find wild strawberries or blackberries to smear on the “butter.” No joke. Now that’s a sacrifice. I agree! The bread I buy is $4.49 per loaf (it’s the only kind my family will eat). That’s almost 60 cents just for the bread. I’ve tried! My husband loves homemade bread, but the kids won’t touch it. Could you maybe try it and cut it more thinly? Just asking because when I was a kid, I absolutely thought I HATED homemade bread, and it wasn’t that … I hated how thick it was! I refused to eat it, but if it was cut a little thinner, it might have been delicious to me then. And toasting it-some homemade breads my kids will only eat toasted. I think it goes along with what K* wrote, for some little kids a thick slice of moist bread might be too much, but a thinner, dry toasty one might appeal more! Thanks for the ideas, but I think in this case, the most frugal thing is to buy the bread that they like. It doesn’t make sense to spend money on ingredients to cook food that they don’t like, which then ends up in the trash. omg don’t forget about ramen!!!! .18 for a light lunch!!! and you can even add some leftover chicken pieces or other meat! YUMYUM! we set us a challenge not to use the A/C till June (we live in GA), we would love to go live off grid one day, once we paid off debt, and saved enough for a piece of land, my husband sweats very easy and i told him today he could turn on the A/C, but he refused, a challenge is a challenge. Yay! I’m so proud of you! I LOVED your post! This just made my day. My husband and I are busting our butts to save money to pay off college debts. We have given up cable service, cut down to one cell phone, and don’t buy ANYTHING full price or without coupons/sales. People always act like we are weirdos, but we are doing what we need to do right now to get ahead later! Thanks for posting this, you said it, sister! I loved the post! Unfortunately I think there are too many Americans who have gotten so used to having what they want, when they want it (even if it means going into debt to get it), that the idea of actually eating PB&J for lunch every day for a week does sound appaling, which I can’t quite come to terms with. I have also made those sacrifices, and still do so that my husband and I can live debt free of my meager salary while he finishes up school, and while yes I would like to be eating that gourmet lunch from Panera everday (I really love their panini’s), I choose PB&J, tuna, and homemade egg salad (all really cheap) instead. Do I get bored sometimes, absolutely, but I also live with the freedom of knowing I will not be drowning in debt anytime soon. Plus who are we to think that PB&J is not good enough? There are enough people in other countries who would think that is a feast; that helps to put it all into perspective! The main reason I read your blog is –accountability! I don’t follow every MSM advice:) Sometimes we use our credit card; Sometimes our debit….sometimes we make money mistakes, and have to correct them, sometimes we just cut our losses! However, I read your blog and remember what to TRULY VALUE—my family, my friends, the opportunities given to me to bless others-whether financially, spiritually, or both!. We are so busy trying to get the “best of everything”, that we forget that we probably already have it! and as a “pretty much” vegetarian, pb&j is my regular dinner staple! I like to vary my jelly, though! it keeps life interesting! Leanne, thanks for adding this verse to your comment. It speaks so strongly to me- I am thinking about woodburning it on the entry to our attic! A lot of vegetarians eat PB on whole wheat for the protein. I don’t think there is any problem with it. I have a daughter who loves PB sandwiches and I have them for breakfast. You can definately feed one person on $30 per week. I feed my family of four on $50 per week and I really think if I had to, I could cut it down to $30 for all of us. I do have a fabulous fruit store near me that has unbelievable deals on fresh fruit and veggies (huge bags of salad for $1, huge bags of cut veggies for $3, 2 lbs of cut up fruit for $2, etc.) I never know what the deal will be but I stop in during my regular rounds and find great deals. Hubs and I lived on PB&J for a little more than a year. It’s not that it was a bad thing. We just kinda got tired of it. But we couldn’t justify the prices of deli meat, either. So for his birthday, we splurged a bit, and bought a meat slicer. Now we alternate between PB&J and home sliced lunch meat at about half the cost of buying it at the deli. It’s not that PB&J isn’t good enough. We just consider lunch meat a “treat” now. hi I just live on porridge for breakfast, omelette for lunch and baked potatoe and beans or salmon, with a banana and apple a day. This is when I am saving to go to the theatre or something. Works fine but then I live alone so only myself to worry about. My other great money saver is a pair of walking boots. We had a friend years ago whose brother and wife ate pancakes every night for supper to save money to purchase something. I can’t remember any more what they were saving for but this worked for them. I wouldn’t recommend doing that because of health reasons but they were young and were able to save the money they needed. I was so encouraged by your previous post!! We just got off a special diet to see if we had any food allergies. The diet helped my husband so much, but we had to avoid dairy, gluten, corn, soy and many many other things. When I looked back I noticed I had spent $800/ month at the grocery store!! After reading your post I felt like I could surely bring it down to my budgeted $400. I started using cloth diapers again. (I already had them, but was just being lazy!) And I also decided that Monday would be soup night. I cook a small chicken in the crock pot once a week (about $5). With the leftovers from the meal and the broth, I make a chicken based soup on Monday along with homemade bread. I dump in the veggies we have or frozen ones and that is what we eat for our lunches every day for the rest of the week. We have stopped eating snacks every time we go in the kitchen too. (I think this is the biggest help!) I am so confident that we can do it now that I know I can make natural healthy meals for a good price. If you wouldn’t have put chicken and frozen veggies in your post I don’t think I would have realized that! Thank you!! I worked with a man that ate PB&J sandwiches everyday for lunch. We worked together for 10 years until he retired. He liked PB&J and not many other foods. I love the post, because I personally know it is possible to live and eat on such a small budget to make things happen in other areas for a family..
Can u elaborate on how u ate a diabetic diet on $25/wk? I hv recently learned that I hv gestational diabetes and am finding the cost of the necessary foodstuffs to be rather high. Depending on your dietary needs it can be done. I had purchased very large bags of flour from an Amish store that were in my freezer, so we made our own bread, which for us was a lot easier on the blood sugar and for me my digestion. We were able to purchase milk and freeze it after we had a yard sale (our Aldis has it for $1.99 a gallon). We used Aldis and other grocery stores that had fruit and veggies or salad on sale and only purchased those items. As for meat that was touchy one. We used cheaper cuts of meat and purchased on sale or found out when our stores put out their marked down meat, this was a huge help. Other then that we cut back on portion sizes. We did not realize how large our portions had become until we reweighed and remeasured at meals. I also did a lot from scratch for our meals and we cut out luxury items like sweet unless I already had it in the house and could make it (like oatmeal cookies.). We used lots of coupons if we were going to purchase some sauces or something along that line. I hope that helps and if you have any other questions please don’t hesitate to ask. Good Luck on your pregnancy!! Our family is currently making several sacrifices to survive during some tough financial times. I think the most obvious, (at least to other people, because we don’t actually mind so much), are driving an older car, living in a small space (a 2 bedroom apartment with 4 active boys can get crazy at times! ), and having a very minimal wardrobe (I literally have 2 pairs of shoes and 3 outfits). We also keep our meals simple, which has actually led to a much healthier way of eating. Lots of fresh veggies and fruit. More homemade items, and almost no processed foods. Honestly, the longer I live this way, the more I start to believe that even if my financial situation takes a turn for the better, we won’t be making all that many changes. We are happy and content. We spend a lot of time going places (parks, museums on free or reduced-price days, etc,) that create memories and bonding, rather than spending money on material items that are unnecessary. to someone else it’s “free” soup made from scratch or grilled cheese sandwhiches.. If your goal means that much to you, you will make sacrifices…and honestly to alot of folks ,to be able to have a daily lunch is luxury…. so again, to each their own, but don’t say you could NEVER do that and yet not even try! Celina, what a great perspective. I totally agree. The idea is go for a GOAL not a RULE. We eat beans twice a month and leftovers once a week. I also double up meals and I’m trying to add another meatless (or mostly meatless; cut back to 1/2 lb. of meat instead of 1-1/2 lbs.). These are OUR ‘pb&j’s. For me & my two girls we could LIVE on peanut butter (I rarely use jelly; I do add cinnamon/sugar sometimes). I feel like it’s a luxury when I haven’t found it on a good buy recently because we eat SO MUCH of it. I gotta be thankful for what I have, use what God gives me and provide for my family with intentionality. Thanks for your positive attitude on this. Last night some friends were asking me how in the world we can afford to send our daughter to private, Christian school. After trying to explain to them that we gave up cable, a home phone, our kids wear yard sale clothes, etc, they still decided they just could never afford sending their own children. I came home and read this post. It was very encouraging to me and can be applied to anything in life that you want, not just getting out of debt. To us, schooling is important so we make sacrifices everywhere else in our lives. To others maybe it is a trip to Disney World or something else. Thanks for the encouragement. It’s amazing what can be done if one is motivated. My parents sent both my brother and I to a private Christian school, and they didn’t have that much money. We gave up a lot of stuff but it worked. And it taught us a lot too. Since there wasn’t any extra money, if my brother & I wanted something, we had to work for it. We both bought our own cars & paid for gas & insurance. I loved to show horses, so I paid for lessons & entry fees (parents paid for gas & trailer). It taught us to appreciate what we had. We also learned to be creative & go after our goals. If we wanted something enough, we could figure out a way to make it work. I didn’t always appreciate it at the time, but it was truly a blessing to grow up that way. I’m a single mom on a teacher’s salary, and I send my daughter to a private Christian school. We have made a lot of sacrifices to do it, no cable, we keep the thermostat set at 79 (in a Louisiana summer! ), we eat at home, I pack her lunch. I do all this because it is important to me. I get questions all the time about how I do it. Just today I was talking about how expensive her uniforms are, but we made it work. I had a budget for them, the price of the skirts meant she only got 3 this year, but they are good quality and I can wash them mid-week, so she really doesn’t need any more. Most of her friends at school have at least 5 full sets of uniforms, some more than that. But I had to think about what was really necessary and what fit into my budget, and we make it work. I’ve heard the same kinds of comments and questions from people (almost always women) about how we can afford for me to stay home with our child (now children). Most of these folks worked in the same field I did and made approximately the same salary I did, but I know their spouses’ incomes probably varied greatly, and of course their debt situations may have been very different from ours (we have always lived well below our means, first to pay off the debt we had when we first got married, then to be able to give to ministries, and later to save up some more money when we decided to have a baby). Still, I’m not sure people realize how much we have given up for me to be able to stay home. One young man asked me at the grocery how I was enjoying “retirement,” and I was amazed. Retirement? Really? Anyway, my point here, I suppose, is that I agree that both of Crystal’s posts were very encouraging, and I agree that people often can make a way when something is truly a priority. Not always, but most often. Great post! And I couldn’t agree with you more! Eating peanut butter and jelly sandwiches for lunch everyday for a week is not that bad. I love PB&J. You are so right! If you want something bad enough you will make sacrifices, you will find a way to get to where you want to be no matter what. If it means giving up something right now so that you can have a better life later, I would agree it’s 100% worth it. People can be very naive to think that they don’t need to change anything and they will just somehow magically be out of debt or pay for something with cash without saving and cutting somewhere in their budget, and learning on how to spend in a smarter way. I don’t think PB&J for a week is so bad. When I was in college I ate just peanut butter sandwiches every day for 3 months because I couldn’t afford the jelly — but it was so I could travel around England so it was worth it! When I came back, jelly seemed like a treat! Just this week, we cancelled our internet service at home. I am able to read blogs and do my budget saving studies on my lunch hour and breaks. There is also so many free wi-fi places where it is nice to have a cup of coffee or ice tea! We also went down to minimal home phone service, reduced our minute plans for our cell phones, and changed our deductibles on our insurance policies. We have begun to practice our $30.00 grocery plan, cash only, (using the Dave Ramsey Black Book Plan) and have completely redone our budget to zero based. Wow …alot of developments in the past six months but doing this to become debt free for early retirement! I often joke that my daughter lived off of p&j sandwiches for years. She was a picky eater and my doctor assured me that they were not all that bad. His advice was to keep offering healthy examples of food. She is now a healthy adult and sill eats those p&j’s occasionally for lunch. I know many of you worry about the sugar in the peanut butter but I have to say she has had one cavity in in her 27 years. Loved your previous post and sorry you received criticism. Some must not have learned the old saying “if you have nothing nice to say don’t say anything at all”. To each their own and somethings may not work for every family. But depending on how willing we are to make sacrifices will definitely play into our success in paying off our debt quicker or whatever goals others may have. Keep up the good work and know that many of us are very appreciative of your posts and ideas. I tend to dislike responding to these type of posts because it is difficult not to sound critical however I disagree with the premise that if we want something badly enough that you will find a way. Sometimes we aren’t meant to find a way. Sometimes there there just plain isn’t a way. Sometimes we have to accept that what we want just isn’t going to happen. I am not saying that there is not value in creating a budget and trying to find any fat to achieve a goal, I am saying that obtainable is going to be different for everyone. However, I believe very strongly that if you get creative and put some feet to your faith, you can go much farther than you will ever go if you just make excuses. Excuses do nothing but keep you stuck. So put on your thinking cap, get creative, and start doing something — and you’ll reap the rewards of hard work and sacrifice, even if you end up in a different place than you hoped to! I didn’t read all the posts, but I don’t think anyone is suggesting that if you try hard enough, and pray enough, it always works out, and if not, you aren’t trying hard enough. I think most people here, including Crystal, are just saying that if you try hard enough, sometimes it works out. Better than never. I think the whole point is, “try, and you never know what you can accomplish.” Sometimes it’ll be less than your goal, but hey, that’s life. Us Americans are over-indulged and spoiled. The thought of eating the same thing more than two days in a row, littlelone a whole week is just upright uphauling to some. But, I think you hit the nail on the head! This article was about sacrifice, and doing what needs to be done, in order to achieve the results you want. Unfortunately, that didn’t seem to go over well with the “I want it and I want it now” crowd. But for those of us, like myself, it was inspiring and a great reminder that change can be made, when dedication and sacrifice come into play. I appreciate the different post . IMO sometimes people go too far with the frugality. Then others begin to compare themselves in regards to who can spend the least or feel bad that they are spending too much. Each of us should do what works best for your family and our financial situation. IMO if you gave growing children you should do the best you can to provide them with a healthy and nutrious diet. The short term savings may not be worth it. If you are fully grown and are making short term sacfrices more power too you. I read the post more for a tip or suggestion and not something I have to adopt. We all make choices about what we value and they are different for each family. I have tried homemade hummus or bean dip and salsa sandwiches. That sure mixes things up and can be a cheaper alternative. I even found whole grain half calorie bread for $1 a loaf that was on sale for 3 weeks at Kroger. It has sure helped my budget and I was able to buy a few loaves ahead hopefully to last until the next sale. We have lived on one income since our twins were born 2 years ago and it has been tough at times losing more than half our income. We have moved to a smaller house to cut down our mortgage, I coupon and buy sales and we don’t buy clothes or many other necessaties if it isn’t on sale or we have a coupon or a need. We have our heat and electric set up for time of use and do all our laundry between 7pm and 7am (and everything else we can delay), I hang most of the laundry outside or on a drying rack/hangers after drying for 10 min, we have our thermostat lower in winter. We don’t have cable, I sold a very nice luxury car that I drove to work everyday (it was paid off but didn’t fit our double stroller and I wasn’t going to work any longer) and bought an older car for less than half of what we sold the previous car for. And in the last 2 months my husbands hours have been cut by about 25% and we don’t know when it will end. I sometimes don’t know how we survive, but I look at it like a challenge to be even more creative with stretching our $ and we have even been saving a small amount. It is very hard and I want to give up sometimes, but it is true if you really want to stay home, or have to save for an upcoming expense you can do it if you REALLY want too. My husbands work partner thinks we are crazy what we sacrifice and he lives pay check to pay check, has a new car loan and no money in the bank-he has to keep up with the Jones, but we have made a decision to live like no one else. I love reading the comments from these posts-helps me remember I am not the only one doing these things, we aren’t crazy! Sacrifice and delayed gratification are just so counter cultural these days. Thanks for the continued encouragement that inching your way forward is still going forward even when you don’t feel like you are. We are truly blessed to have all we do have! When I re-read this I didn’t want it to sound like I am saying everyone should do it or sacrifice if they don’t want to. This was a decision we made that it was best for our family if I stayed home and we are just making personal sacrifices to make it all work. God has been providing and not always in the way I expect it will be, but we are surviving. As a child, I would eat ONLY PB&J sandwiches for lunch for several years. My mom was concerned, but doctors and family members assured her that I’d be ok (especially since I had a healthy, unprocessed dinner). I agree that for some, it’s grilled cheese, for others it’s soups, etc. In college, I would sometimes eat tomato-mozarella paninis with basil for days because that was my favorite dinner after studying. I keep a cookie sheet in my freezer – every weeknight I place leftovers on the cookie sheet and freeze them in manageable portions. After they are frozen, I place them in baggies or containers. On the weekends, we use these frozen leftovers for meals. I save money on six meals a week. I can make soups or casseroles out of the veggies and meat. Sandwiches can be made out of leftover chicken too. Even pancakes can be frozen and reheated. Crystal, my husband and I wanted to give you some positive feedback and share our story from last night. Yesterday on his way to class, my husband’s car finally up-and-died. We have been expecting this day to come, but we thought we would have more time (as we have resolved to pay cash for the replacement). When we were talked about a game-plan to get through the next month, I put to use every skill and trick I’ve learned from following you for the last 8 months. When we got to talking about groceries and food, I said “WAIT!!! Hold on! There’s a post on this! !” and pulled up your $30-a-week grocery post. We pulled out every bit of food in the pantry and made a meal-plan for the next month and used much of what you had origionally posted as a template. We really needed the encouragement of “it can be done” in that moment, and we wanted to let you know how much we appreciated having your ideas available to us last night! Love this post! We’ve been living in a travel trailer for 2 years, so we could afford my husband’s schooling…and you know what? He finished last week, and all his school bills are paid-in full and we didn’t even use any government grants! I appreciate this post!! A lot of the things my husband and I do to save money may sound outrageous to some… but you’ve gotta do what you’ve gotta do (within heathly, moral boundaries of course!). We don’t pay for cable, for a long time we didn’t pay for internet, we share one car.. and we usually eat very simple meals! We have found that we can eat fairly healthy and cheaply if we plan ahead and make wise choices. And yes, PB & J is on our weekly menu- for sure!! Thanks for your posts- love ’em. I just finished eating a peanut butter and jelly sandwich! I’d love to hear tips/suggestions/advice when only one partner is on the band waggon to being frugal. My husband says he wants to get out of debt yet is totally unwilling to sacrifice anything. I’m trying to do everything I can to cut back wherever I can because I figure if at least one of us is trying, it’s better than neither of us trying. Yes, I know we should probably get marital counseling but there again hubby is unwilling. I am going for counseling — and praying and “waiting on the Lord” but….am I the only one who is on this boat? Does anyone else struggle with being the only one “on board”??? Kristi – I am right there with you. This is a huge issue for us right now. I am doing everything I can, but no transformation from my spouse yet. I’m starting to feel a little desperate! Like you, I am just praying and praying. I am in that boat, too. My hubby agonizes over our debt verbally, but is unwilling to give anything up. I don’t think sacrifice is fun, either, but I want to work toward the bigger picture. It’s frustrating. Anyone hv advice for me? Oh, and we are going to a counsellor, but hubby doesn’t want to implement. He only goes bc I hv asked that he go with me. My husband is on board with being frugal, but it was a huge eye-opener for him to sit down with me and make our (reduced) budget this year. When we added just the essentials up, it equaled his salary. No wiggle room! Looking at this together helped us be on the same page as far as spending. We are also committed to sitting down together at the end of each month to examine our spending and keep on track. Like the others said, you have to make a budget together, set the goal, and you both have to agree to it (I would withdraw the cash you can each spend weekly and that’s it, maybe have envelopes that you can save cash in, for bigger things like a new pair of shoes or a car repair). That is the first step. Without the budget, it will never work, because there are no limits….everything is a grey area. If it is very defined, like “this is the cash we have, so deal with it,” then no one can fudge. But first you gotta agree to the limit. One day, hubby and I decided that $200 was enough for us each week, for food, lunches out during week, entertainment on weekends, and clothes if we wanted to save the extra, and that was all we would ever spend, aside from our automatic payments that come out of our checking (rent, utilities, cable bill). He agreed to it, and we started making the cash withdrawls weekly. The only thing we use our credit card for is gas, but you could easily make that part of your cash. You gotta make it black-and-white. Tell him you’d like to start living off a cash budget, and ask HIM to choose the amount that is withdrawn weekly. Just to put it more simply, if you don’t have a specific “number” on what you spend on non-bills/non-fixed weekly, that is why your husband isn’t following it….because there is nothing to follow, literally. Then you gotta withdraw it in cash. For us, there was no other way to keep track, or resist temptation. It was the only way. My last suggestion is to build aggressive debt payoff into the picture, when you decide what to spend weekly. We decided to put an extra $100 per week towards our student loan, and set up the automatic transfer of that money, before we decided we could withdraw $200 a week for food and non-needs (variable expenses). We live in one of the priciest places in the country, so you may be able to live on much less. It is nice to also build in (when deciding your weekly cash allowance) a small cushion of about $100 weekly that is not dedicated to something, in case you HAVE to pull out the debit card because you are stranded somewhere, or you need an extra tank of gas that week, so keep that in mind, but I would honestly make it a rule to only spend your cash. I eat PB and J probably 3 of 5 days in the week. The only problem is it doesn’t fill me up for too long….especially being 30 weeks pregnant! This week is a great example that I planned to buy lunch meat but then had an unexpected expense that had to pull cash from the grocery budget. I had $35 to spend on our food as well as a meal for another family and food for a Pampered Chef party. The lunch meat will justh ave to wait until next week:) PB and J it is! If my husband wasn’t allergic to peanuts, we’d be eating a lot more PB&J too!! 🙂 I just finished deciding not to upgrade my “dumb phone” to a smart phone or even another dumb phone that I had to pay more for because the extra money isn’t worth it to us right now (or feasible) as we work to pay of student loans and credit cards! My 2 year old phone is still working great for how I use it. We also don’t have cable, don’t buy new toys (Craigslist is awesome for used toys, we just got a $30 swing set), try to get our clothes for free or very cheap, and coupon with groceries. Thanks for the encouragement everyone, it is so helpful to know others are living the frugal life, too! And, we are very spoiled as Americans, most people in the world would be thrilled to have a PB&J every day! I have so enjoyed this post! I really like the analagy of the PB&J being something different for everyone. Every evening when I clean the kitchen I put the leftovers in containers for my husband and I to have for lunch at work the next day. Last week I sooo wanted to stop at the donut shop on the way to work and get a donut. But I opted for having a bagel that we already had and I felt so good later that I made that choice. Some might not think that $1 made that much difference, but in my mind it was huge! Thank you for sharing your ideas, suggestions and recipes! We have benefited greatly from them. We eat pb&j all the time, and we aren’t even on a $30 budget. It’s reasonably healthy, filling, easy, and inexpensive. What more can you ask for? Sure beats fast food in every department! I have not read all the previous comments so I may be repeating a point that has already been made. The complaints regarding PB&J’s reminds me of a quote I have seen (I think perhaps you have posted it on this site before). “Those who really want something, will find a way. Those who don’t, will find excuses.” Those who complained about PB&J’s apparently aren’t at the place where they are determined to cut back to that extent. Personally, I think rather than complaining about PB&J’s we should count ourselves blessed to be able to fix them. There are plenty of people in this world that would consider it a feast! I think that life is rarely so black & white for most people. My pastor at Hope Pres. here in Memphis totally suggested that- lunch and dinner! :) Love the idea, and don’t listen to those naysayers!! It’s so true that if you want something bad enough you usually find a way to make it happen. What is important to one, always isn’t important to others. Such as if my goal is to save for a nice vacation every year and that means for me to skimp in other areas to make that happen, that’s the way it works for me. I also want to add that I LOVE what you said about needing to make sacrifices to make progress. I think so many people get stuck on wanting to get what they want without having to change anything. Very good point you made! I liked that post! What I don’t like is how people just don’t know how to read. You clearly stated SAMPLE MENU and more than once I believe. Anyway, we had PB&J for lunch at the park today. Better than pigging out on some overly fried fast food, right? keep up the awesomeness! I love your blog! My whole family loves PB&J. We prefer it over any other cold sandwich. My husband eats it everyday in his lunch…by choice. To make a standard PB&J better, grill it like grilled cheese. AMAZING!!! What’s wrong with one meal being the same everyday, if your other two meals are always changing? Some people only eat 2 meals a day anyways. Then some people eat cereal every morning….and even if it’s a different cereal, they are all pretty much the same nutrition-wise…..so what’s the difference between those cereal-eaters and PB sandwich eaters at lunch? Peanuts are legumes (beans), so they have potassium (right? )…I don’t see the problem. If you eat enough green veggies other times of the day, you are fine. PBJ is better than most meals most Americans eat. Growing up with my little brother to a single mom and thinking back at how much she had to sacrifice just to make ends meet and keep us from ever being hungry I commend her and anyone and any household out there that does it (makes sacrifices). We always ate at home and as funny as this may sound, McDonald’s and Taco Bell were major events for us and rare. They were huge rewards for me and my brother and we appreciated it so much. We wore hand-me-downs and shopped mostly at thrift stores and also received assistance. My brother and I are all grown up now and making a good living and happily paying back the help that we received. Like you said Crystal, it isn’t easy, but definitely do-able (for the most part), and totally worth it. We never went hungry and were never deprived of good education. Everything else can pretty much be sacrificed to some degree. That’s my opinion. This post is very interesting to me!! I am wondering though if it would be cheaper for us as I would have to make the gluten free bread and we buy all natural peanut butter??? One of my coworkers who makes a very nice salary eats peanut butter & jelly sandwiches for lunch almost every day.. Not because he cant afford anything else.. but because he loves that more than anything in the world. There is nothing wrong with eating PB&J every day of your life, if you like it. Myself, I’d rather eat beans & rice.. but either way.. they’re fine! Let those who dont like it not eat it.. Its that easy. After reading your post I had to comment. Me and my 3 kids all eat PB &J everyday for lunch during the week. It’s quick, easy, and delicious. Of course we use only the highest quality bread, peanut butter and jelly. Its a life saver and it’s our routine! Guess what I am having for lunch tomorrow??? I am not trying to stay at $30/week (far from it). Sometimes, you have PB&J because it is simple and you are in a time crunch. We discovered we could save a whopping $70/mo by cutting cable. It’s a bigger sacrifice for my husband than for me, but it’s amazing how much more fun it is to watch movies together or go for a walk instead of parking ourselves in front of the television to watch another show. The shows we’re really attached to we buy off iTunes and still end up saving around $50/mo. Yep. We got rid of our DISH. I have to have internet for my business as well as my cell phone, but that is definitely a HUGE item in our budget that seems disproportionate to other expenses. But I don’t know any way around it. When saving for our new home, if we couldn’t eat it or wear it, that item went OFF the budget. We gave up the internet for two years (YES! You can do it if you really want to. The library has it for free.) We hung laundry, cut our grocery budget to $350 a month (family of 6), I made every meal from scratch, mowed our lawn with an old-fashioned push-reel mower, went to no garage sales (If I didn’t see extra items, I would not feel the need to buy them). My husband rode his bike to work whenever possible. We had an eating out budget of $10 a month. So, we only went out every other month(and then used free children’s menu items to eat for about $20.). We gave up our newspaper subscription and have never had cable TV in 24 years of marriage. The result…. we saved 35 percent of my husband’s income. WELL worth the sacrifices! I come here not because I am committed to a frugal lifestyle, but because I like the perspectives and reading this blog because Crystal is so positive and excited about her lifestyle. I love that someone could buy a house outright, for example. I also love that she permits herself some joy in life, too – my first fear about embracing a more limited lifestyle was that I would no longer feel comfortable buying a diet coke or going out to dinner. A lot of the tips here wouldn’t necessarily work for me (reusable rags, for example – I live in a small apartment and wouldn’t be able to wash them before they started to stink because I have to go to a laundromat and with my law school schedule, I don’t have the time! ), but I use them as a jumping off point for a way to save money in my own life. Freezer cooking is a lifesaver for me! I had to laugh about the pb&j. When my husband was alive, he made his own lunch and every day, except payday, he’d make a bologna sandwich and a pb&j sandwich! I always figured that was his “dessert”. LOL! Oh, on paydays, he’d send me to McDonalds for his lunch. As hard as he worked, I’d have gone to McD’s for him every day but that’s all he ever wanted. I went to cloth diapers when each of my children was 6 months (girl and boy), I think it hurried their potty-training to have the sensation of wet diaper. I liked your post and think you are right on. My husband and I ( I am pregnant by the way and eat more 🙂 Survive on $14o a month for groceries no matter how many weeks are in the month. It can be done and we eat lots of fresh fruit and veggies as well. Now its not easy and we don’t eat much meat but its worth it to make it financially. I love your post and appreciate your encouragement! I have been a single parent for the last 17 years and 5 years ago my daughter got married in Las Vegas (her dream wedding). The only problem was getting to the USA and all the other bits like a dress clothes for myself hotel food the lot but thanks for cheap sliced bread,jam and chocolate spread. I did it had a great time came home with some money and best of all no debt. You can do anything when the going gets tough. I wish I could say our family is making sacrifices, but my husband is not willing to make them. He must have cable and movie channels even thought he is barely home to watch them. He must not only have a new expensive truck, but he must also purchase expensive accessories to go on it. He must eat out for his lunch at work every day and often on Saturday if he is out as well. If his spending money runs out, he will put lunch on the credit card. I drive a nice car but the payment is less than half of what his is and mine gets 30 mpg. I get grocery/spending money and if I use it all up before the next pay day, I stop buying things. I don’t use the credit card. I don’t even watch tv if he is not home and the kids rarely watch, so I know they would be happy with Netflix. He says he has financial goals of paying off the credit card before our son starts college next fall, but he also says he is not willing to changes our (his) lifestyle and said we will just have to borrow the money for our son’s college. This is not the financial life I want for myself and my children. I stress myself out trying to find ways to make more money and finding ways to save money on college for our boys and everything little bit I do feels like it gets undone by my husband in a quick swipe of the credit card. I’m sorry you’re going through this. It sounds like you may benefit from some couples counseling, and if he doesn’t want to go, you should go. I feel the same way as you. At least he got rid of his car habit, which was a huge financial strain. He sold his car because he has a company car and we only really need one car now. But he has $240 a month, which is something I increased in the budget in the hopes he would stick to it, and he can’t seem to find a way to stick to that, then just uses the debit card instead, which leaves us short for utility bills, debt payoff, etc. He must eat out every day because “he’s a traveling salesman” but why can’t he make something & take it instead of spending $5-10 every day on food. Or use his money that is in the budget to eat meals out? I stop spending when the cash runs out. So I feel your pain. Plus the expensive cable package we don’t need, but he must have because he has to watch his premium cable show once a week? Interesting that they are so similar Laurie! After a recent tour of the college my son plans to attend, we did sit down and he hashed out a plan to pay off our credit card in the next 6 months and then get another larger debt down quite a bit before my son starts college in 2016. Our family actually has a good income and we don’t qualify for any financial aid for college, but I feel like if we made some sacrifices, we could handle the cost of college much much easier! I purchase my one premium cable show from Amazon. I watch it the day after it airs and it’s $26 for the season! My husband was similarly self-indulgent. I decided to only pay the minimum on his card, so it was always maxed out, while I paid my off and didn’t let him know. It helped – paying to but curtailing his spending and having an emergency option (my card). My husband used to be like this and would still like to be. A couple of years ago we were really in deep debt so I put my foot down, put us on a budget and am slowly changing our habits. He doesn’t like it but I told him that he would have to handle all the finances himself if he didn’t do it this way. Since he doesn’t want to do that, he has resigned himself to do it my way. I feel so much better and I know we are certainly better off. Oh my goodness, my husband sounds like your husband. I read all these stories and wish that I can start that in our home. My husband will not entertain the thought. We are very well off however old credit and unpaid student loans hover over us. It is insane the amount of money we pay for cable, cell phones and eating out. I know if we cut that we can make a huge dent into our unpaid bills. How do you motivate your spouse to start???? It’s not easy changing the habits of an adult but involving a third party may help some. You can visit a CFP professional (Certified Financial Planner) and/or counselor. A lot of planners have tools that will take all of your financial information and show you what the effect of your husbands current habits are doing now and what your future will look like. In these situations it can look quite shocking. Experienced planners are also usually equipped with ways to work through these issues with your family. Unfortunately, it’s not always easy to get your spouse to agree to these meetings and a planner can only educate & suggest, the actions are ultimately up to the Sometimes it just clicks one day for them and sometimes it never does. I wish you all the best of luck working through this matter. Before we had kids, we set our thermostat to 64* in the winter. It was cold, but it helped our heating bills. We weren’t saving on food because we had a goal but because there just wasn’t any money. Macaroni and Tomatoes was a go to and we still make it once a month….Home made soups of all kinds and home made breads really stretched our dollar. At that time there wasn’t anything like cable just the 4 to 6 channels LOL. No internet or ipads just the house phone and we made good use of it. P&J sandwiches were on the menu many days. My parents are 69 and 71 and can eat whatever they want. 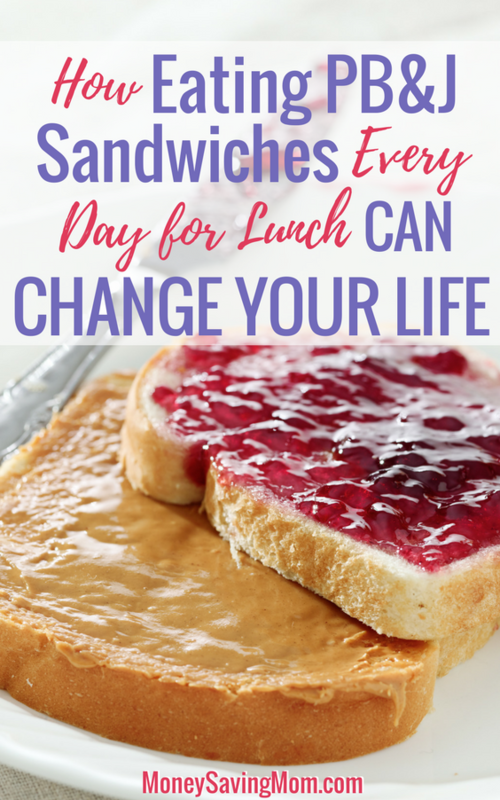 They choose to eat peanut butter and jelly sandwiches for lunch every day. I think people need to chill out and stop hiding behind a computer screen with their snarky comments and negativity. What works for one doesn’t work for all, but there is no need to jump down people’s throats. I am sorry, Crystal, that you feel that you often have to write follow-up posts to apologize or defend yourself. People just need to be a little nicer or use more manners. For many years we were struggling with a house payment, vehicle payments and credit card debt. We had very little money for food. I would buy lots of dry beans and add to spaghetti and macaroni and cheese instead of meat. My husband had come up with a meal that he enjoyed that had eggs cooked in ramen noodles. We would shop at a food salvage store that carried dented cans ect but at deeply discounted prices. We also would go to the thrift bread store for our bread. We did ok, I would write all the food we had in a notebook and come up with meals that I could make with them and know what I needed to buy at the store. I came up with a very healthy recipe made with dry lentil beans and sandwich sauce put on buns for sandwiches. I also shopped discounted food bins that have food near expiration. We rarely bought any sweets or what we would call extras. I enjoyed peanut butter on toast for breakfast and dessert sometimes. There was also a church that helped struggling families with certain amount of food for a small donation that we took advantage of. We made it through our rough time and things are much better today and I still love peanut butter on toast. I like the tone of this blog. I am a working mother, but I find the suggestions on this blog and other blogs to be very helpful. I like the budgeting piece as well as the simple homemade recipes. I feel like I get the best of both worlds (working mom and stay at home mom). I use to eat peanut sandwiches on one slice of bread for breakfast and lunch because it was easy and a good source or protein. I worked part-time at a big-box discount store for about 15 years, so the house could be paid off before DH’s planned retirement. Now that there are no mortgage payments and no car payments, we are able to pay for house remodeling in lump-sum payments. The firms we have dealt with offered discounts for paying this way. I’m thankful you included other ideas, such as adjusting the thermostat. I’m a fairly new reader, and while I don’t get angry at pb&j suggestions, I do get very frustrated and discouraged because I have a child with food allergies. Often, the cheaper grocery options aren’t options for us because she’d land in the ER. But this article encourages me to think of other things, like maybe switching to powdered creamer instead of half and half, that will help me move towards my financial goals. The title says it all -“if you want something badly enough”. The PB&J haters just aren’t there yet! My husband has earned more towards our bottom line with smart investing and savings than I have through a paycheck. So spouses of spend thrifts take heart and stay the course! The problem with PB&J is that many people make them the unhealthy way. It’s crazy cheap to make “jelly” by blending or simmering frozen berries and chia seeds (and super healthy) and you can even make your own nut butter with your food processor or blender. Seriously – try it. Healthier and cheaper. Ta da! Sprinkle in some cinnamon and add a banana and you’ve got a pretty healthy, hearty meal for pennies…..
We had a financial setback so I had to turn the air conditioner up a bit. It was too drastic so I just turned it up a couple of degrees, just enough to not notice a huge difference. I then continued to turn it up a degree once every couple of months. We went from huge electric bills from keeping it on 72 during the day (we live in the HOT south!) and 68 at night to 78 and even 79 if not too humid during the day and 76 at night. Any lower and we (6 of us) are all complaining about being cold, lol. We have to remember to turn it down when we have company for their comfort. Very, very occasionally, if a day is exceptionally hot and sticky, I may bump it to 77. It is rare. A gradual approach works wonders! This is one of the biggest areas where people can save money. Some of my coworkers buy their lunch every day, and buy snacks and soda from the vending machine. This is at least $7/day, which over a month is $140. Over a year of time, that well over a thousand dollars, just for lunch and snacks. No problem if someone wants to do that, but if a person is looking for ways to save money, that’s a key area.